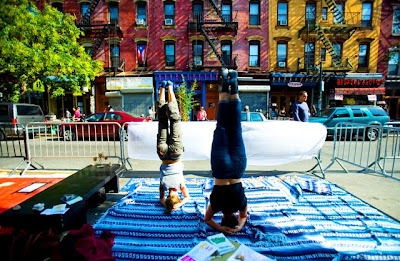 Yesterday was Park(ing) day! The lovely day where people can transform parking spaces all over the city into whatever they want. Strangers on the street were invited to jump in and swim around. It was a nice day in NYC so I just had to take a dip. It was my first swim of the summer! 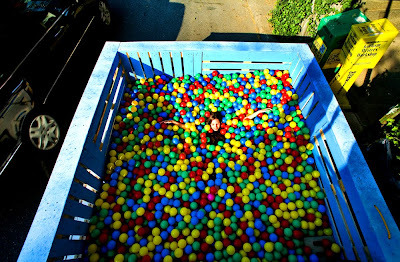 ball pits are my favourite way to swim. Colorfull, crazy and I don't have to wait one hour after eat to swim. Wow, seriously?! I've never heard of this (and I'm from NY! ), but it's absolutely brilliant. And I bet you don't have to pay! Har har. 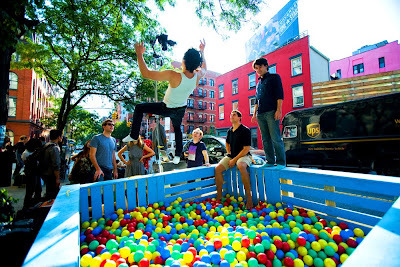 I cannot think of a better environment for you than giant, multicolored ball pits. haha! I would love to build one in my house and just sleep in it. Yayyyy! I LOVE the ball pits!! They don't let me in at our indoor themepark, so this would have been a lot of fun! i've never heard of this before, but it sounds amazing! i havent swam in a ball pit since my mcdonald's days... hahaha. WHere was this? I've lived in NY for 8 yrs and never even heard of it! What an awesome idea...Im surprised it wasn't yours! I just found your blog via www.jodified.com 's mention of you today and am totally IN LOVE! 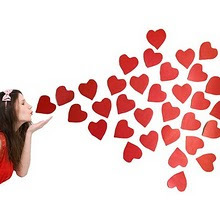 Your blog is sooooo inspiring and beautiful! How fantastic! I wish i could have been there! What a great idea. I think every city should do something like this. Nothing like bringing the kid out to play...love the ball pit. Looks like fun. that's so cool! i never heard of this!!! i live in nyc, i think we should be friends. lol! Great pictures! I love the action shot with the balls! 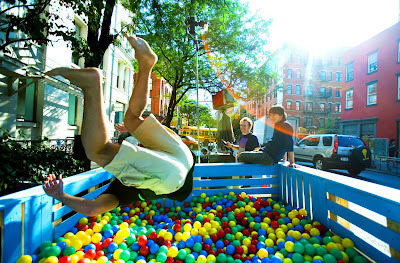 OH man, ball pits were always my favorite at Chuck E. Cheese growing up. This looks like so much fun! Well this is just too much fun! I'm traveling, exhausted and sitting in a hotel room. When I saw you had something new up...I thought, "I could use a little Katie right now". I would say that you are doing something right! What the heck? I wish I knew about this! 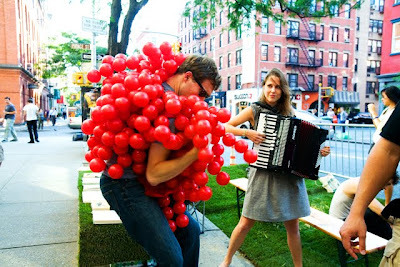 I've always wanted to live in NYC & your blog reaffirms my desire. Keep up the awesome & creative work. I'd love to schedule a trip to NYC & schedule a family photo session with you too... we'll work on that! Thank you for the little (and big) rays of sunshine! You're so sweet Ginny! If you ever come to NY I would love to do a shoot with your family! Hey Katie, I found your blog yesterday through one of my friends that follows your blog. I just wanted to tell you what an inspiration you are! You seem like the most beautiful person to me, spontaneous, upbeat, and living your life for all it's worth! I don't think anyone can walk away from you (or your blog for that matter) being the same person they were before. You are beautiful! awww thank you so much Gianina!!! I didn't know they let you transform parking spaces to whatever you wanted every now and then. That's so cool! What a fantastic idea...looks like it was a lot of fun. I wish I lived somewhere which would let us be free spirits like that, gorgeous pictures :) I hope you got into the ball pit! Such a cool idea. I love it. I just love your blog, Katie. It is always a place where I know I will find JOY. Thank you for another installment in FUN!! omg that ball pit looks like so much fun! takes me back to my childhood. Oh my what a cool idea!! It looks like so much fun. Amazing! Thanks for sharing the images, they're beautiful :). I miss New York so much... Thanks again for your pictures. I LOVE that yellow tent! 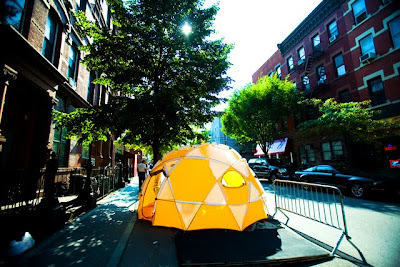 It´s exactly what I´ve been looking for, without knowing...anyone here who can tell what this type of tent is called and where I might look for one...? This makes me want to visit New York city even more!